Co-authored books is a trend in YA literature that I fully support. In A Really Awesome Mess, Trish Cook and Brendan Halpin have worked together to create two distinct, engaging voices for the narrators, which made it easy to tell who was narrating at all times and made sympathizing with both Justin and Emmy that much easier. The supporting characters’ voices were just as authentic and unique. I can still remember all of their names and problems – which is something that I can’t say for a lot of other books I’ve read. 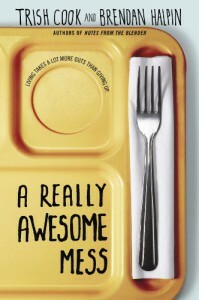 A Really Awesome Mess manages to touch on heavy themes including eating disorders and depression without sounding “preachy” or melodramatic. The story is infused with snarky humour and ridiculous situations that kept me laughing throughout the ~300 pages and made for a surprisingly fun read. Thanks to Netgalley for providing me with an advanced copy of this book in exchange for an honest review.